Ok, so here is our latest update on baseball. We got back from vacation and immediately started back to baseball. Dylan's end of the season tournament thankfully held off till we got back and we started that Monday. There was a heat index of probably 110 degrees it was soo hot! Drew was also playing and there were a couple of games that were at the same time. Dylan won his first game so we advanced and played the team that ended up winning the tournament. We played two games in one night and the heat was horrible so I was very proud of the way everyone played. We played again Tuesday night and won that game so that moved us to Thursday to possibly play two games. I can say our first game on Thursday was a nail biter. Those boys played their hearts our and we came out on top...I was glad because that was the game me and the ump went round and round. 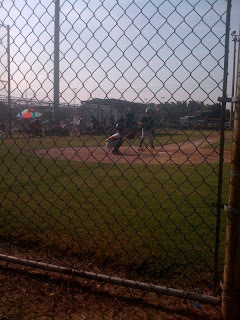 I wouldn't say I'm a "baseball mom" but other would tend to disagree, but when my son tips the ball and both coaches agree and the ump still calls him out, I'm going to "go off"(which I did)....I told him he needed glasses(he ended up telling the director that he made a mistake...ya think!!!) Anyway, we lost the 2nd game we played and we argued about that one because once again the ump doesn't have his own watch and goes by the scorekeepers time and her time just happened to be 10 minutes off from everyone else's..not going to say she was from the opposing team! :) We ended up finishing 4th in the tournament which I thought was a great accomplishment for our team since the majority of them are 1st year pitching machine. So, Dylan made all-stars and we are continuing with baseball for the summer. 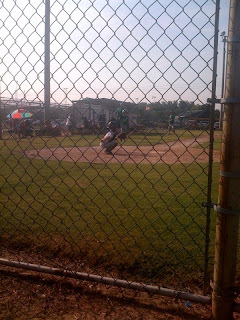 He has been playing catcher and doing a really good job. He's only been playing ball for 2 years, but this is the first position that he is wanting to play. He is really wanting to learn this position and is really good at it! He told the coach the other night that was throwing pop flys to him that he wanted to keep trying to catch the ball until he caught three in a row. Wow-that is my son!!! You go Dylan. We had our first scrimmage tonight, wasn't very good. We've really got to improve our hitting and also some fielding. We will get better. The coach told us after the game that if he would have had a game ball Dylan would have gotten it for playing catcher so good. I think this is the position for him. We have now gotten a pitching machine(thanks, Deb) so we are going to get to work on hitting more..he really needs to improve there! We've got a lot of work to do and hopefully within the next week we will improve. I'm really wanting to go to State because we will get to go to Pea Ridge, which is where Landon plays. I don't care if we play them, I would just like to be there with them in a tournament. So wish us luck that we will hopefully get there!!!! We start our tournament next weekend, so if you guys don't have plans come on to Van Buren and watch Dylan play(DAD). I can't make this post all about Dylan because Drew is still playing too! He played the same week of Dylan's tournament and won two and lost two. He's not done yet, his end of season tournament starts next week and we have a game Monday night. If we lose we're done, so cross your fingers we win or he is done and wish me luck because Chris goes out of town Monday and won't be back till Thursday and with his games and Dylan's practice I don't know how I'm going to manage. He doesn't have all stars, but we are thinking about putting him in fall pitching machine with Dylan and seeing how he does. Yes, we are continuing with baseball through October with Dylan. We haven't decided about Drew yet, we think he will be good at it, but we are still hesitant because of his age. If anyone has advice, please give it to me!! Anyway, that is our life in a nutshell right now. We live and breathe baseball, but we ABSOLUTELY love it!!!! Come watch them play, it is so much fun!!!!! !